FRA LA FINE DEL 2016 E L’INIZIO DEL 2017 LE ORGANIZZAZIONI DELLA R.E.S. VALDERA, ED ALTRE AGGREGATESI APPOSITAMENTE (TRA QUESTE IL WORKCENTER OF JERZY GROWTOSKI & THOMAS RICHARDS, IL LABORATORIO SOCIALE UJAMAA ED IL CINECLUB AGORA’), HANNO IDEATO MOMENTI DI INCONTRO SUL TEMA DELLE MIGRAZIONI ED ATTIVITA’ DA REALIZZARE INSIEME AI RICHIEDENTI ASILO, TESI DA UN ALTO A COMPRENDERE LE RAGIONI STRUTTURALI ALLA BASE DEI MOVIMENTI MIGRATORI, E DALL’ALTRO A ROMPERE LA BARRIERA CHE SPESSO SI CREA TRA CHI VIVE DA TEMPO CHI ARRIVA IMPROVVISAMENTE IN UN DATO CONTESTO SOCIALE. NE E’ NATO UN PROGRAMMA FITTO DI INIZIATIVE (LABORATORI, DIBATTITI, INCONTRI, HAPPENING TEATRALI, CAMMINATE, ECC.) 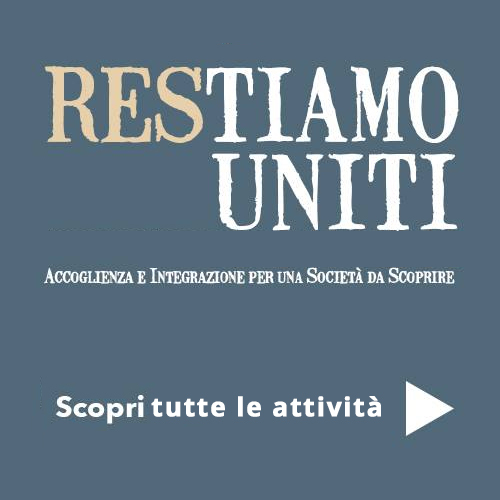 CHE SI SONO SVILUPPATE TRA IL MESE DI MARZO E QUELLO DI OTTOBRE 2017); TUTTE LE INFORMAZIONI E LE IMMAGINI DELLE INIZIATIVE SONO REPERIBILI SUL SITO RESTIAMO UNITI – ACCOGLIENZA E INTEGRAZIONE PER UNA SOCIETA’ DA SCOPRIRE.